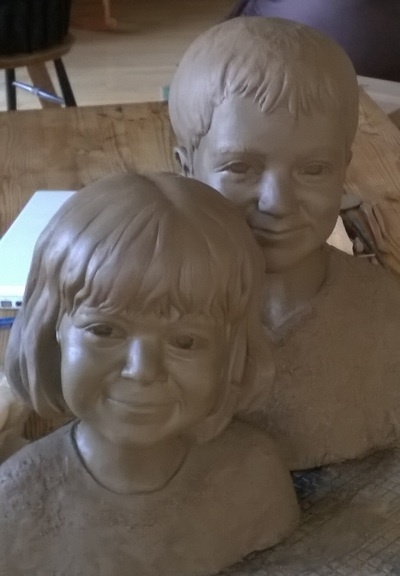 The double portrait busts are finished in clay and instead of firing them in the kiln, I’d like to cast them. They are not dried out, but still softish damp clay. Damp clay won’t stick to plaster or silicone. When I was satisfied with the bust modeled in clay, I started to make a mold, this is a bit like a jelly mold and will allow me to make more than one reproduction of the busts. The fine detail of the portrait will be copied using a flexible silicone mold. Silicone is a sort of soft synthetic rubber. This forms a thin layer that can curve under slightly, going into the hair, ears, eyes and nostrils. When the silicone layer is removed it stretches so it can be taken off without damaging the cast. To hold this floppy silicone layer in place there is a jacket of hard plaster, often called a mother mold. The plaster mother mold has spaces that fit special bumps on the silicone, these are called register keys and ensure that the silicone layer is positioned correctly inside the mother mold. 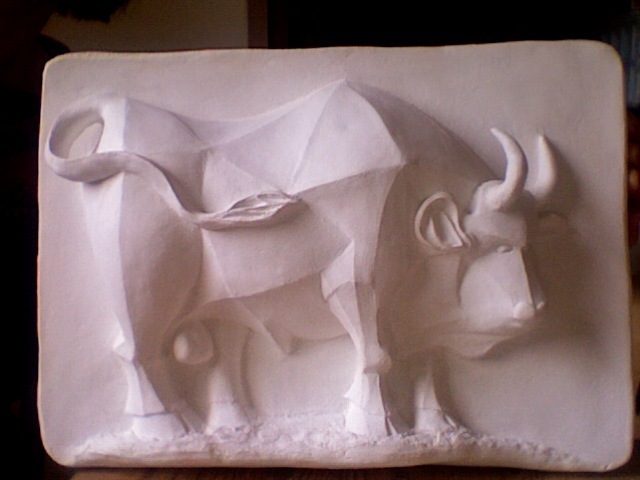 I’ve used this same process when making a relief of a bull inspired by a Picasso lithograph. 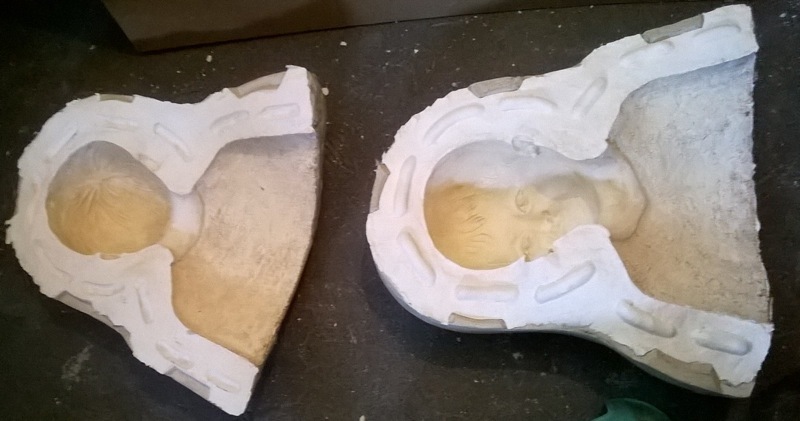 For a bust, the mold is made in two halves, producing a front and back, each with a flexible silicon layer and a rigid plaster outer layer, these two halves will fit together. The first step is to position the bust, face up, on a steady table, making sure the back of the head and neck are properly supported. Then you need to build up a clay edge all around the bust, build this up in clay of a different colour so you can tell the difference and don’t accidentally start scraping at your original bust (I used grey clay for the edge on a dark brown bust). Another tip is to lay the bust on cling film so that a thin layer of cling film (saran wrap) is between the two clay colours, let a half centimeter of this lay on top of the clay edge. Choose a line, going from the arm, up the outside of the shoulder, up the neck and over the head to the other side. It’s best to choose a route that doesn’t have too much detail, the line doesn’t have to be totally straight. This line will be where the two halves meet. The clay edge needs to be quite wide because it’ll have various register keys and the sides of the plaster mother mold on it. Make the edge very very smooth on top and bring the edge of it right up to the bust. Once it’s ready, scoop some rounded register keys into it. Some people make a smooth furrow all the way around the edge, I just scooped several 4cm long spaces out. These will let the two silicone halves of the mold position exactly with each other and with their respective mother molds. Now make up some thin silicone and dribble it in a fine stream over the face, neck and chest. It will continue to flow for quite a while and end up pooling on the edge and in the register key spaces. The silicone may also dribble onto your table or floor, don’t try to wipe it while it’s liquid, just wait until it has set and then peel it off. Get a block of clay, flatten the top and create about 20 conical spaces in the clay, fill these with some of the silicone and leave them to set overnight. These will be little conical register keys made of silicone, they will position the silicone mold inside the plaster mother mold. Here you can see the grey clay edge, the brown clay of the original bust and a thin layer of silicone over all of it, pooling in the register keys (indentations in the grey clay edge). The next day you can trowel over a good layer of thickened silicone making sure to fill in any overhangs so that the rigid plaster mother mold can slide on smoothly without catching. Position the conical register keys into the silicone around the outside of the bust (and on it too) and let it set. The wet silicone is very sticky but can be patted smooth with a sponge covered in cloth that has been dipped into a strong solution of washing up liquid and water. Make the silicone layer as smooth as possible. First cut some register keys into the outer edge of the clay edging. These will be to position the two plaster mother molds onto each other. Use a sharp knife to slice through the silicone and down about a centimeter into the clay. Make these register keys very smooth with bevelled edges. Here you can see two types of register keys: At the top are two dips for aligning the silicon back and front layers to each other and at the bottom of the picture is the cut-away for positioning the mother mold halves on each other. Now make up some plaster and smooth it over the top of the silicone layer. The layer of plaster should be 2-3 cm thick and should have some hessian strengthening in it. Make it nice and thick at the edges and be sure to fill those freshly cut register keys. Make sure the plaster is nice and smooth on the outside otherwise you’ll scratch yourself when handling the mold once it’s dry. As always with plaster, have a bowl of water for hand and tool washing, dump this on the garden when you’re finished, never into the sink or toilet. Turn the whole thing over to expose the back of the head. Peel off the clay edging. Wipe everything clean of the clay. Smear a thin even layer of vaseline over the exposed silicone surface and the exposed plaster in the plaster register keys which are now protruding. The silicone mustn’t stick to the next layer of silicone, the plaster mustn’t stick to the next layer of plaster. Now go back to step 5 on day one and repeat the entire process. The back half of the mold is ready for its plaster jacket, the mother mold. Note the different types of register keys. Here you see the back half once it’s ready for the mother mold. The silicone is cleared from the plaster register keys at the edges, the conical silicone register keys are set into the silicone around the mold to position it into the mother mold and the long humps are along the divide to match the two silicone halves together, the surface of the thickened silicone has been patted down. 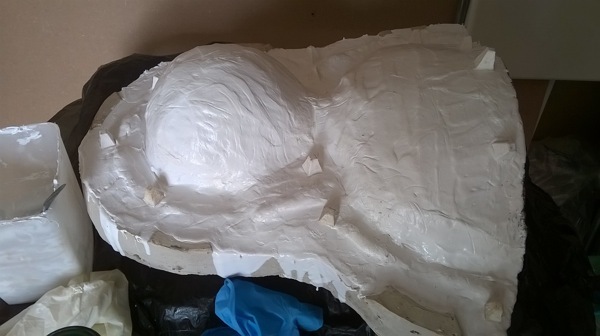 Once the back of the mold, including the mother mold is set, it’s time to scrape away at the sides until you can see the divide all the way around, now gently but firmly prise the halves of the plaster mother mold apart. You’ll have a mother mold on one side and all the rest on the other. Slide your fingers between the two silicone layers all the way around the edge then gently peel back the silicone. The clay bust can be discarded, the mold is ready for casting. 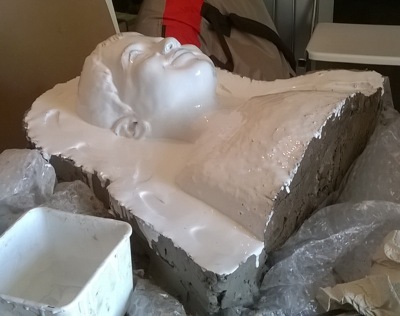 This entry was posted in casting, technical and tagged bust, how to, mold, mother mold, register keys, silicone mold, two part on May 3, 2015 by Lucy Mellersh.